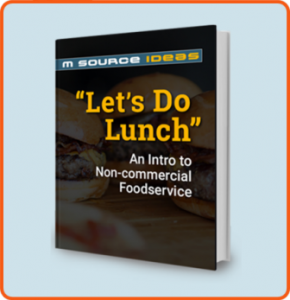 Our eBook about the non-commercial foodservice space is for food brands and other product or service providers who would like a brief tour of the space from someone who’s been there. who are the biggest players in the industry. It’s worth understanding because you have some dynamic demographics — such as college students — in this market and some very large, stable customers, which makes the space very attractive. Large businesses, government entities and non-profits are healthy places to target your marketing dollars. These folks aren’t going anywhere, anytime soon. Use the form below to provide some details. Your download will begin when the form is submitted.